Ghadar Di Goonj غـدر دی گُونج (the echoes of revolution) was a compilation of the Punjabi poetry from the times around the War of Independence in 1857. The book was published in early 20th century from San Francisco and its circulation was banned in British India. Dear reader, just to catch the moods and taste from the early stages of the Ghadar, the 1857 freedom movement, let’s relive one of the poems from the publication. In part 1 of this post, we had concluded our session at the Gogera Fort as we listened to the folk rendition of the tale of Rai Ahmed Kharral by Wali Din. As is true of all epic stories, our heroes in the lore have a seemingly unnoticed admirer right in the middle of the action who serves to memorize the minutest of details, and he does that in a poetic manner, as poetry serves memory better. It was Homer, who through Iliad brought to life the tales of Achilles, son of the goddess of water and Hector, the tamer of horses. We have a Mehru Posti reaching out to us with the chivalrous accounts of Dullah Bhatti, taking on the Mughal Crown at Delhi and Lahore. In case of Rai Ahmed Nawaz Kharral, dear reader, we meet Dada Phogi. It’s Phogi who tells us that the Kharral Chief during the days of rebellion, had declined the offer of allegiance by the British citing those legendary words, “Kharrals never share their land, horse and wife” (a pity that I could not find the actual Punjabi idiom for this dialogue). Following the refusal to take sides by the British, the tribes of Bar swore their allegiance to Rai Ahmed as they decided to take on the British with all the ferocity and force. Here comes the tale of treachery as one of the Kharral leaders from the other clan decided to switch sides and became an informer of these proceedings for the British Administration. There were other tribes as well including Sikh leaders who stayed loyal to Company Bahadur, winning, in return the protection and rewards from the Raj. The fighting force of Ahmed Nawaz met British forces in the Battle of ‘Noorey di Dall’ at the Rakh (forest) of Gashkori just outside Gogera. Dada Phogi tells us of a motivating speech delivered by our hero culminating at a war cry that was followed by a fierce assault on the Firangi commanders and their troops. The ferocity of the attack uprooted the front lines of British soldiers and it was in the heed of the battle that our lion-heart stood up to offer Zohar prayer and the cunning enemy spotted an opportunity for the fateful shot at Rai Ahmed. Dada Phogi tells us that the order to kill Rai Ahmed was delivered by Berkely and the fateful shot was fired. It was 10th of Muharram, the day of shahadat of Hazrat Imam Hussain in Islamic Calendar, and it was the day when our hero Rai Ahmed Nawaz Kharral (as the folk tale tells us) fell to the British. The shot was fired on the orders of Lord Berkely who was to meet his own end in the coming days. Murad Fatiana, a tribal leader and a comrade of Rai Ahmed in fight for independence, swore vengeance. He had his shot at Berkely a few days later who, while leading a troop of horsemen was isolated near the banks of Ravi and was killed by the lance of Murad Fatiana. Having enjoyed our share of the tale from Wali Din, me and Irshad bid our farewells and came out to visit our next landmark that was in near vicinity. Just outside the town in the almost neglected confines was this Christian Cemetery from old times that was reported to contain the grave of Lord Berkely, the extra Assistant Commissioner of Gogera District back in 1857. As we walked past the walled entrance, there was a neat patch with comparatively new graves. The remaining of the graveyard was almost obscured by thick weed and tall grass, and camouflaged in them were the outlines of some old grave like structures. A straight forward access to this area was not possible so I had to climb on the perimeter wall and display some funambulism skills to walk my way up to those obscured corners. I discovered the remains of a couple of graves, badly neglected and almost demolished. There were no gravestones or any other inscription to tell us something of the identity of the beings buried there. With me back at the gates, myself and Irshad observed a moment of silence in prayer and moved back to Gogera town. This is what survives of the grave, also it might not be Berkely’s grave as there are a couple of other graves in such condition. Dilapidated, desecrated this chapter of history lies neglected under settling dusts of time. Back in Gogera, Irshad hosted me at a cellular company’s transmission tower, where the security guard was from his village. Within minutes of me taking a chair in open air beside the guard cabin, Irshad Kharral turned up with all the guest accessories he could lay his hands on. These included almost everything; snacks, cold drinks, tea and biscuits. Though I only craved for tea at that moment, but to refuse other items would have been pure sin. I continued with the refreshments bit by bit as Irshad, for me, had some stories from history. Kharrals trace their descent from Rajputs. They were converted to Islam through the personal mentoring of Makhdoom Jahanian Jahan Gasht, although Irshad differed with that and insisted that it was the famous saint of Pindi Bhatian who was the religious mentor for his clan of Kharrals to embrace the new faith. It was in the late Mughal era, presumably during the reign of Alamgir that Kharrals became the landowners of significance in the area of Bar. They enjoyed good relations with the neighboring Sikh landlords during the rule of Maharaja Ranjit Singh. During that period Rai Ahmed Khan was the chief of Upera clan of Kharals with the lands surrounding Danabad, Syyedwala and Jhamra. When Punjab was annexed by the British, Rai Ahmed was still a leader of significance in the trans Ravi region. Another leader from Kamaliah region was Sarfraz Ahmed, who was chief of Lakhera clan of Kharrals. In 1857, when an aging Rai Ahmed Nawaz (in his eighties) decided to raise arms against the British oppression, it was Sarfraz who siezed the opportunity of taking the secure side of the battle, the side of the British. The next stop on the journey was Jhamra, and for that we had to cross Ravi and ply on some remote routes and it was already nightfall. I had already chalked out a plan to recline to the ever inviting compound of Okara Cantonment and promised Irshad to join him the next morning for our impending journey. Back at Okara, I was greeted by Colonel Fazal Abbas Kazmi, a dear companion of old times. In the tea bar of his regiment, as we enjoyed a lavish treat of dinner, we recalled some good old times. An evening rich in history, took a unique flavor of nostalgia as it turned into the night. Post dinner, we enjoyed coffee, smoked some pipe, and Fazal took me out in his vehicle on an orientation visit of the Cantonment. “Okara by Night”, it was and trust me on this, dear readers, such an initiative is the sole prerogative of a military commander, and only a military commander. Fazal was generous and hospitable and his company refreshed me to the core. Having said goodbyes, as I took on the bed to catch some sleep, I had only one thing in mind, the following day trip to honour the Kharral Chief. It was then I had some time to reflect on the chronological facts, the British version of the story, and here in contrast with the oral tradition of Dada Phogi, we have the printed pages from the Gazetteers, and we have a handful of them; those from the districts of Montgomery, Jhang and Lahore. The British Gazetteers describe Rai Ahmed as “a man above average, bold and crafty”. Around mid 19th century, Kharrals in the region of Sandal and Ganji Bars were primarily divided into two sub-clans of Uperas and Lakheras. Uperas belonged to the area of Jhamra and Danabad and had Rai Ahmed Khan Kharral as their leader. Sarang, the chief of another minor sub-clan Begke Kharals was a close friend of Rai Ahmed. Lakhera Kharals inhabited Kamaliah with Sarfraz Khan as their leader. The game was very much “on” following the news of the Meerut Mutiny that reached Gogera through Lahore. Rai Ahmed Khan Kharral, being a man of influence was asked to swore an allegiance to the British which he flatly declined. There were preemptive measures taken by the district administration at Gogera. Deputy Commissioner Captain Elphinstone had disarmed the treasury guard and the police battalion from district jail was moved to the treasury. From then on the guard at the jail was provided by the force of Khem Singh and Sampuran Singh who stayed loyal to the British during the uprising. There was an attempted jail break on the night of July 16, that was attributed to a presumably instigating visit of Rai Ahmed Nawaz a couple of months back. The outbreak was suppressed with 51 prisoners either losing their lives or getting wounded. Following this, Rai Ahmed summoned a meeting of the local chiefs at Kamaliah to organize an armed uprising against the British. The Wattoos, Fatianas and Wehniwals vowed to take sides with Ahmed Nawaz and it was Sarfraz Khan of Lakhera Kharals who immediately after the meeting rode straight to Gogera on the night of 16th September. He reported to Deputy Commissioner the developments in the Bar and in doing so secured a force despatched to protect Kamaliah. On 17th September, Lord Berkely, Extra Assistant Commissioner was sent with 20 Sowars to capture Rai Ahmed who was reported to cross Ravi that day to reach Jhamra, but they were unsuccessful in their task. Later on Captain Elphinstone joined the Berkley detachment with reinforcements. Ravi was crossed, but Rai Ahmed was not found. In the absence of Rai Ahmed, other villagers and cattle were taken and Jhamra was burnt. By 19th of September Gogera had received reinforcements from Lahore. Lieutenant Chichester with a detachment of the 1st Sikh Cavalry arrived on 19th and Colonel Paton with his force comprising three horse artillery guns, one company of the 81st Battalion, a company of the Native Infantry and a party of mounted police hurried towards Gogera. On the other side Rai Ahmed Nawaz having joined by Wattoos planned an attack on the Sadr station at Gogera and crossed Ravi but retreated after having met resistance on the outskirts of the town. On 21st of September the force under Rai Ahmed Nawaz had concentrated in the forest of Gashkori, about six miles south of Gogera when Captain Black and Lietuenant Chichester with a detachment of Cavalry supported by Infantry were sent to destroy them. A sharp fight ensued and in the beginning hours British cavalry had to retreat. Later on that day, during the battle, Rai Ahmad Nawaz along with Sarang, the chief of Begke Kharrals was killed. In the aftermath of skirmishes, Murad Fatiana, an ally of Rai Ahmed Nawaz, took on Berkley in an encounter in the jungle of Kauray Shah off the banks of Ravi. Lord Berkley was killed and heavy losses were put on the British detachment that had to retreat to Nur Shah. 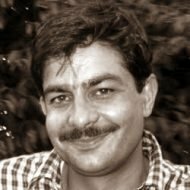 With Rai Ahmad killed, the resistance lost its impetus and the remnants were suppressed quite easily. Murad Fatiana, who had killed Lord Berkely was apprehended and dispatched to Andaman Islands, the infamous ‘Kala Pani’. The road to Jhamra, if one takes a right turn immediately after crossing Ravi is not very pleasant one. It’s a forgotten route dwindling past small villages primarily used by the motorbikes, tongas and donkey carts. After a drive of about one and a half hour, we arrived at Jhamra. The ancestral graveyard of Kharrals lie about a Kilometer or so away from the village. It was an ancient gravesite where a lot many old styled graves studded the ground. There was only one tomb of prominence that belonged to our freedom fighter Rai Ahmed Nawaz Kharal. The tomb was built in the style of traditional sufi shrine with a white dome. The arched gateways and the tomb interior had the beautiful work of glass mosaics. The structure still wore the colors of cemented grey that told us of an impending renovation. Guided by Irshad, I headed to the grave that was housed in the central chamber. A day before, back at Gogera Fort, Wali Din had told us how, after falling of Rai Ahmed Nawaz, his severed head was taken by British and put on display at Gogera Jail. The headless body of the great warrior was buried by Kharrals in their ancestral graveyard at Jhamra and Legend has it that the head of Kharral leader was sneaked away by one of his faithful companion and buried in stealth near the grave site. Irshad told me that when the tomb was first built by the descendants of Rai Ahmed Kharral (quite a few decades ago), upon digging in the surrounding of the grave, the severed head was discovered and re-interred with the body. I was at the grave of one of the valiant soldiers of the 1857 independence struggle, who decorated the mainland Punjab with the colours of chivalry and honour. I was humbled to be in attendance at the shrine of a man of great caliber, who chose to fight and thus lived in our hearts through the tales and ballads of valour, in absolute contrast to those who switched sides and were rewarded with the lands and money they have never ceased to parade, even today, and dear reader, we shall come to that towards the conclusion of this post. I had to bid farewell to Irshad Kharral,but that was not going to happen without a plentiful dose of the traditional Sardaai, rich in milk and cream. As I took my route out of Jhamra, there was yet another destination on the charts. Ahead of Jhamra taking a detour towards Satiana, I was to ply on Satiana – Jaranwala road, and ahead of Jaranwala the journey was to continue on Syyedwala road. Having out-skirted the historic village of Danabad, the destination was a small but ancient town of Syyedwala, right on the banks of Ravi. A mileboard on the route announced of a (to be constructed) Sher Shah Suri Bridge on Ravi Pat’an, and it was the Suri King who is reported to have founded Syyedwala. Tracing it’s origins to the Suri period, the city has taken quite a few transformations and is scattered on three segregated tracts of land which were inhabited during varying periods of history. Qadeem Syyedwala was founded by Sher Shah Suri as an intended Capital in an attempt to relegate Lahore, the Mughal Capital, to a town of little significance and fame, but the plans never materialized. The town was destroyed by Ravi Floods, reportedly in the times of Mughal ruler Alamgir, and the settlements moved to the land now called Purana Syyedwala. Purana Syyedwala, along with Gogera were the busy markets in the days of British Raj particularly when the District Headquarters relocated to Gogera. In 1857, this place was a refuge for the freedom fighters and offered stiff resistance to Angrez Sarkar. After the death of Rai Ahmed Kharral, as the freedom struggle was subdued, Purana Syyedwala witnessed the true British wrath. It was here, dear readers, where gallows were constructed in abundance, grouped hangings of freedom fighters were executed and their bodies disposed of in the local well that got converted into a mass grave. The town was burnt and eventually Naya Syyedwala took birth at the location of present day settlements. In my quest I was headed to Purana Syyedwala and arrived at the banks of Ravi. The bridge that was announced on the mile-board on my route, was still somewhere on the planning papers as the people were rallying on boats to cross the river. What had attracted me right at Ravi was a secluded domed structure, a pure Mughal era construction. 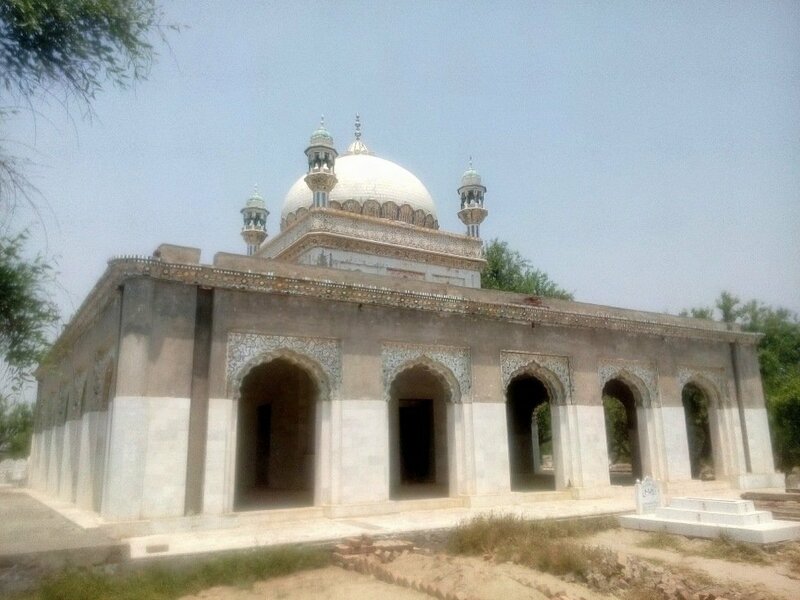 Though not backed by the historical references, the tomb appeared to be the last resting place of some local feudal chief that must have had significant links with the Mughal Court. I had come across such tombs on my other explorations at Tapiala Dost Muhammad and Serai Mughal. Here there were no names that could be associated with the tomb, and the local stories had that typical “saint of faith” and a “gurudwara” version that was hard to digest. There in the surroundings of the tomb was a clump of trees with a shrine and the arrangement appeared to be an old graveyard with some old banyan trees. The people of Syyedwala indicated the clump as the place where mass hangings had taken place during the days of British Administration in 1857. As I roamed a bit further, came across a colonial era building, now in ruins but still serving as the Syyedwala Police Station. Syyedwala had seen the hostilities from Mughals and the British Sarkar alike but had the tenacity to live on. Its spirited people had outdone the odds and Nayya Syyedwala was bustling with life and freedom. There was an emotion of respect and honour for the valiant ones who sacrificed their lives while safekeeping their freedom. In this post we talked of people who regarded their freedom of utmost importance and sacrificed their lives to safeguard it, but there were others who opted for the timid yet convenient alternative of treachery, and stood by their defiant rulers. These ‘allies’ of the British Government were rewarded with lands and awards and have their names and references recorded in the documents of history, obscured by the dust of times and memory. I came across these eye opening lines while browsing through a document of significance that cites the names of the ‘loyals’, the ones who rose to prominence in the aftermath of Gogera struggle. There will be more of these mentioned elsewhere. This is one dark chapter of hour history, but is a bitter reality in itself. The phrase I came across, is reproduced in exact wording as follows. It is more pleasant to record the names of those who were conspicuous for their loyalty, and were rewarded accordingly; they are – Babas Khem Singh and Sampuran Singh; Sarfaraz Khan, Kharral Chief of Kamalia; Kanhaya, Khatri; Dhara Singh; Jiva Khan, lambardar of Akbar, father of Hussain Bakhsh, at present Zaildar; Sirdar Shah; Machi Singh Arora, of Kuliana, father of Alayar at present a man of influence in those parts; Jamiyat Singh, Khatri; and Murad Shah. Sajjad sahab, thank you very much for your kind words. I am glad you liked the theme in the article. This is an amazing article. Loved it to bits. Keep up the good work. These are very kind words. Thank you for the visit.